IT WAS game, set and match for keen tennis player Adam Cowdroy when he dusted off his snooker cue and ended a five-year wait for a first Cuestars winner’s trophy. 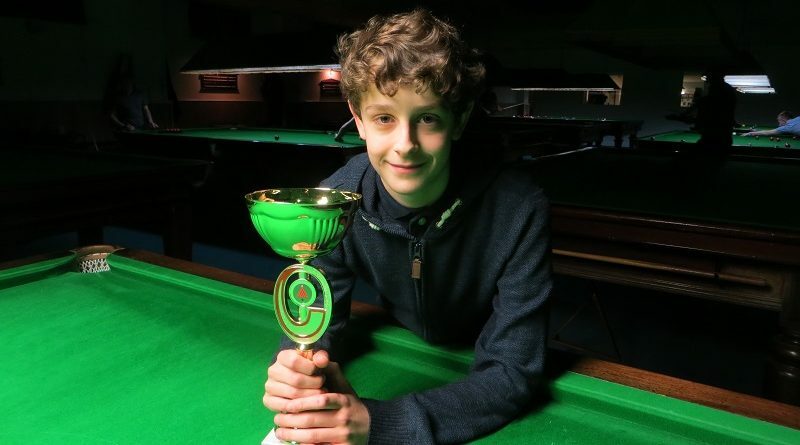 The 14-year-old from Bournemouth cruised to a 2-0 victory over rankings leader Owen Jenkins in the final of the sixth leg of the Under-21 Bronze Tour. In fact, Cowdroy didn’t drop a single frame all day on home tables at Greenbaize Snooker Club. The teenager, who now focuses more on his tennis, was competing in his 27th Cuestars event. He made his debut in October, 2013. Cowdroy insists he has hardly picked up a cue since last September. He said: “I’m happy because I pretty much haven’t hit a ball since the first event in Salisbury. Fifth-leg winner Thomas Sharp (Portsmouth) lost in the semi-finals for the fifth time this season. He went down 2-0 to Cowdroy but climbed to second place, seven points adrift of Jenkins. Jenkins, ten, scraped through the group-stages as one of the two best thirds and edged Dylan Smith (Tunbridge Wells) 2-1 from 1-0 down in the last-eight. Nine-year-old Harry Wyatt (Ferndown) lost 2-0 to Jenkins in the last-four. Fourth-placed Wyatt has now qualified for the knockout in five of the six events in his debut season. Six-year-old William Thomson (Chandler’s Ford) had another day to remember. He took tournament winner Cowdroy to the final black and beat rankings leader Jenkins. And Daniel Walter (Portsmouth) recorded his highest competitive break of 24 in his group-stage victory over Thomson. ROUND-ROBIN GROUP A: 1st, Adam Cowdroy (Greenbaize, Bournemouth); 2nd, Daniel Walter (Mayfair, Gosport); 3rd, Owen Jenkins (Waterlooville Sports Bar); 4th, William Thomson (Chandlers Ford SC). ROUND-ROBIN GROUP B: 1st, Dylan Smith (Victoria SC, Tunbridge Wells); 2nd, Thomas McEvoy (Salisbury SC); joint 3rd, Will Kempson (Salisbury SC), Sam Walter (Mayfair, Gosport) & Freddie Turner (Salisbury SC). ROUND-ROBIN GROUP C: 1st, Harry Wyatt (Chandlers Ford SC); 2nd, Thomas Sharp (Waterlooville Sports Bar); 3rd, George Laxton (Waterlooville Sports Bar); 4th, Eddie Mason (Salisbury SC); 5th, Katie Griffin (Jesters, Swindon). QUARTER-FINALS (12 points): Cowdroy 2-0 Laxton, Sharp 2-1 McEvoy, Jenkins 2-1 Smith, Wyatt 2-0 S Walter. SEMI-FINALS (15 points): Cowdroy 2-0 Sharp, Jenkins 2-0 Wyatt. FINAL (25/18 points): Cowdroy 2-0 Jenkins.